A twelve years old princess of the world of magic. She has beautiful long blue hair and she is very pretty. Mint is a generous young girl sent on earth to bring happiness to everyone. She has special magic power and helped by her magic wand and bracelet she can transform anything. 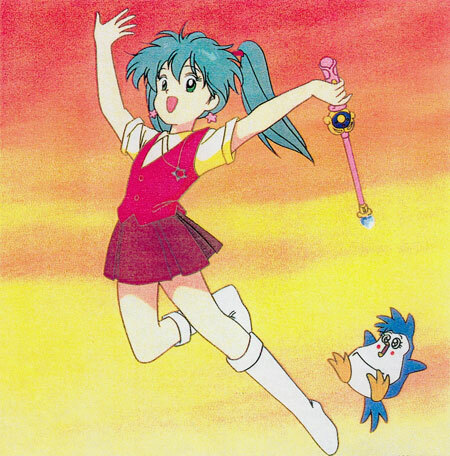 She is always accompanied by her tiny flying penguin which makes a particular sound. Every time she needs her powers she spells magic words any rhymes. This delightful, fantastic animated series brings out the needs of friendship and love amongst the human kind, too often concerned with materials things and forgetting the fundamental values of life. © ASHI PRODUCTION. Licensed by Animation Int'l.